Manny Delcarmen to be activated off disabled list tomorrow; Is this a good or bad thing? Dustin Pedroia off crutches, Tek a "couple weeks" behind schedule. Theo Epstein expects Jacoby Ellsbury and Dustin Pedroia to return in early August. Rangers still maybe intrested in Mike Lowell. Victor Martinez progressing thumb injury; Could return during next road trip. Clay Buchholz holds up in rehab start. This is clearly putting makeup on a pig. Red Sox call up Fernado Carbera, send down Robert Manuel. We all saw how that worked tonight. Celtics out of the running for forward Matt Barnes. Celtics hire Lawrence Frank as assistance coach to replace Tom Thibodeau. Shrek and Donkey are back!! 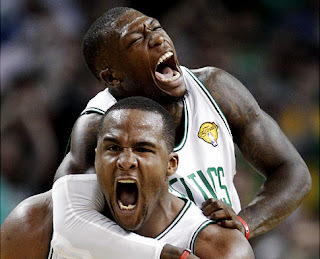 Nate Robinson agrees to a 2 year deal with Celtics. Tom E. Curran gives you the Five Things not to worry about going into training camp. Peter Chiarelli: Trade Market has "grinded to a halt"
Read about the Sea Dogs loss to the Rock Cats, Manny Delcarmen and Jeremy Hermida rehab appearances and much much more at the Hadlock Headlines.